This term, the College held two important events for our Year 7 and 8 students. The Time and Space program offered an opportunity for our boys to deepen the connection they have with a significant person in their lives. The first few years of secondary schooling can be a mix of emotions for both young men and parents/mentors – change and growth are never easy! 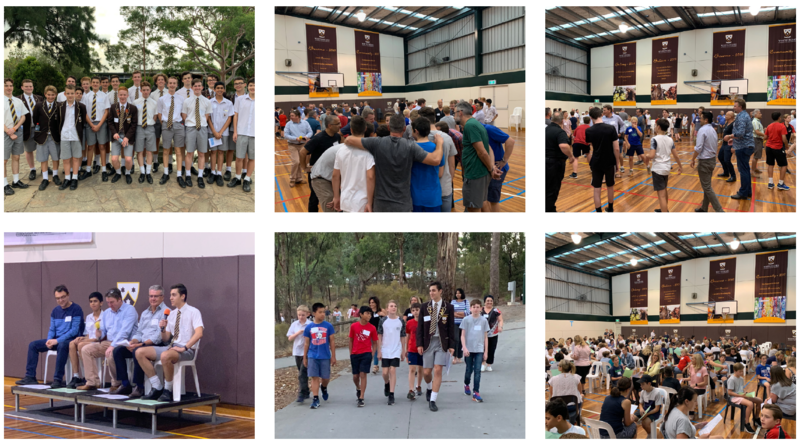 On Monday the Year 8 Father and Son Night created the time and space for dads/mentors and their sons to learn from each other and share their experiences, memories and hopes for the future. Being a dad/mentor today can be a challenge, and often the person who can provide the best advice about their important role are the people they least expected: teenage boys! This was followed on Tuesday with the Year 7 Mother and Son Evening fostered the time and space for mums/mentors and their sons to stop, reflect and share in a supportive environment. With over 240 people gathering in the gym for this experience, the College was alive with real excitement as mums/mentors and their sons deepened their knowledge of each other and learned from other people’s journeys. The generosity of our community was evident by the huge number of our senior and middle years students who volunteered their time across both evenings to help welcome and support our visitors and younger students involved in the programs. This included the mothers and fathers who had been involved with Time and Space in past years, and who generously gave up their evenings to be leaders for the experience. A special acknowledgement to Bill Jennings, founder of the Time and Space, who facilitated both evenings.